I typically get up for school days at the last minute possible to get everybody out of the house. I’ve always been that way. When I was in school, I slept until I heard the first round of buses pull up at the bus stop which was right next to my house. That gave me ten minutes to get up and dressed to get on the second round of buses so I could get to school. It got worse when I was able to start driving to school. I’m just not a morning person. I don’t get to bed much before 2 AM most nights so that 7:30 AM alarm is brutal. If I’m lucky, I get to sleep until the alarm. The kids are either still or asleep or occupying themselves. Last week, J had an early morning doctor’s appointment that I needed to drop her off at. The office she was going to opened at 7:30 and she needed to be there at 7:30. It was close to L’s school, but I couldn’t drop L off until 8:00. That gave me about a half hour that I needed to kill and the best way I could think of to do that was breakfast. L was pushing for McDonalds but she doesn’t realize you can get Chicken McNuggets for breakfast, so I said no to that one. 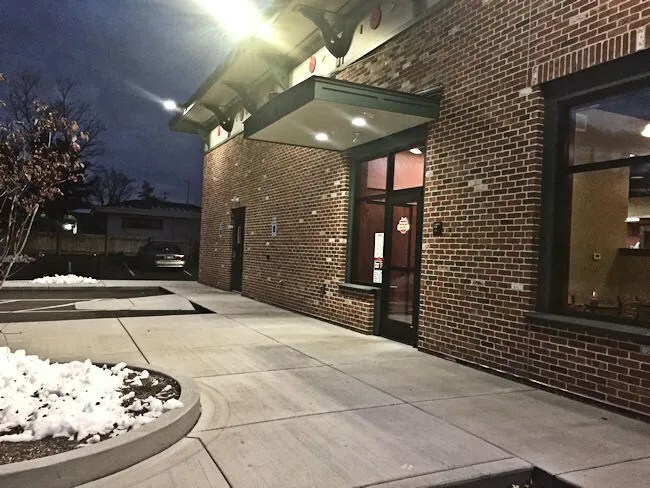 I drove past the McDonalds on Westnedge to the new Big Apple Bagels shop on the corner of Westnedge and Parker Avenue in the Westnedge Hill Neighborhood. 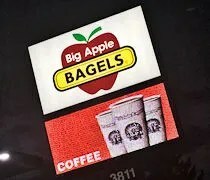 Big Apple Bagels used to have a presence just down the road at the corner of Whites and Westnedge, but that one closed in 2014. 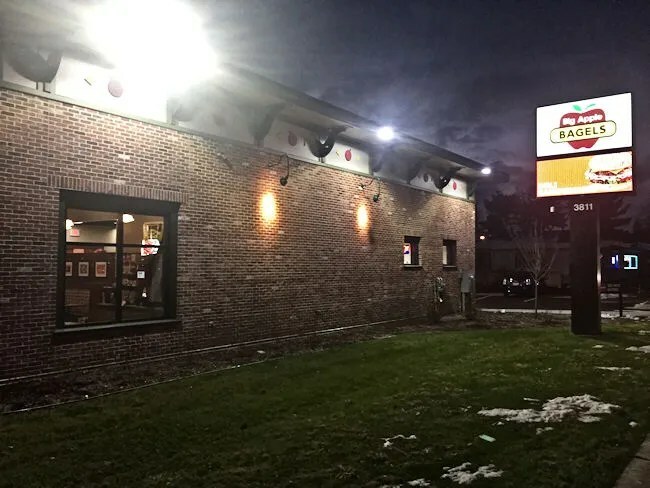 In an Kalamazoo Gazette article from the time, the parent company blamed that closure on the franchise holder and said immediately they were looking to reopen with a different franchisee. That building is now home to J. Gumbo’s. The building Big Apple Bagels is in now is brand new….built from the ground up. I just watched this build all summer and was excited to finally see it open in early September. 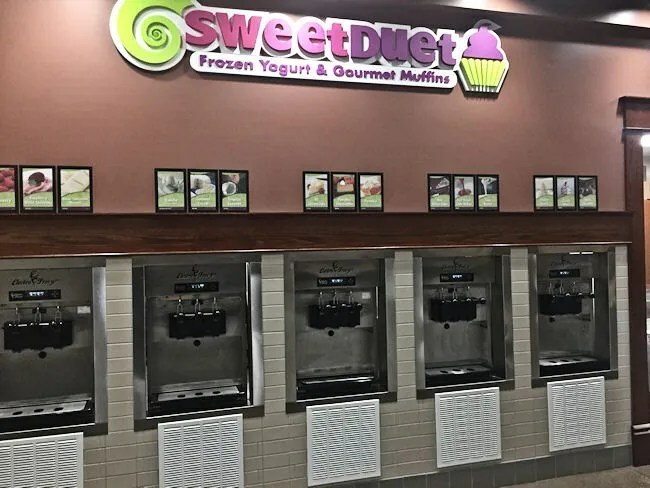 It’s much bigger and much better suited for the cafe which also features Sweet Duet Frozen Yogurt. The chain of stores as been around for a while in the Kalamazoo area. They have a location on West Main across from Qdoba and one in Portage in the Woodbridge Hills Shopping Center. 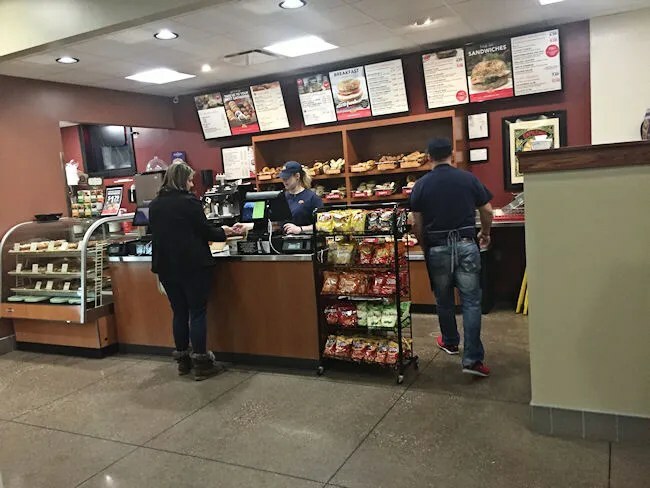 Overall, the Deerfield, Illinois based chain has a little over 100 stores under the brands of Big Apple Bagels, Brewster’s Coffee, Jacob Bros. Bagels, and My Favorite Muffin. The Westnedge side of the building is really the back of the building. It looks a little odd because what you see from the road really isn’t that appealing. The parking lot and main entrance is on the east side of the building accessible from both Parker Avenue and South Westnedge if you’re traveling north. 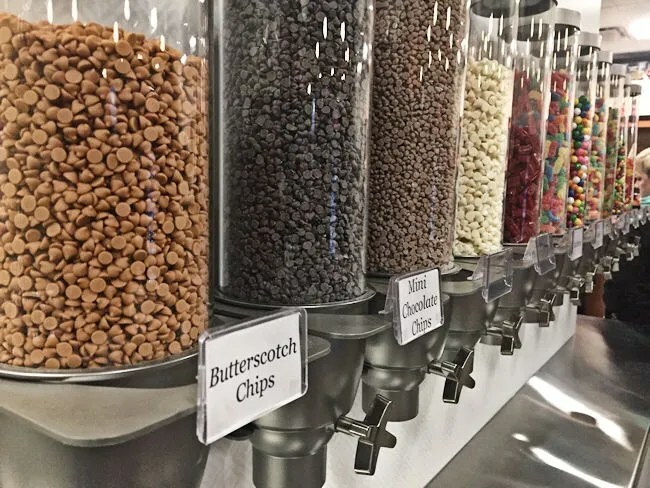 Entering the building you actually have to walk past the frozen yogurt toppings to get to the order counter. Of course, L noticed that right away and started asking for candy. I explained to her that it was for the frozen yogurt and took her around the corner to see the machines, but that just made her want froyo. Can’t blame them for putting that right up front. Big Apple Bagels is like a lot of bagel shops. They have a large variety of bagels in bins and baskets behind the counter. You can get those bagels the traditional way with a little cream cheese and eat them like that or you can go for a sandwich. J works just down the road from BAB and picks up coffee and bagels for the office from time to time. I was just looking for breakfast for L and me with maybe a little something for B too. L was easy. She saw Cheetos. Daddy was tired and didn’t care so I grabbed the bag of Cheetos and threw them on the counter. Don’t judge me. I wanted something a little more filling than a bag of chips. I ordered the Southern Tradition on a Cheddar Bagel. I was asked if I’d like it toasted so it took a few extra minutes for that to happen. I grabbed a bottle of Coke out of the cooler for myself and a bottle of water for L. The total for breakfast came to just under $10. Then L, B, and I headed towards a table in the dining room. The dining room is small but cozy on the other side of a dividing wall from the front entryway. We were the only ones there, but before long, I felt like we were intruding on something we shouldn’t have been. 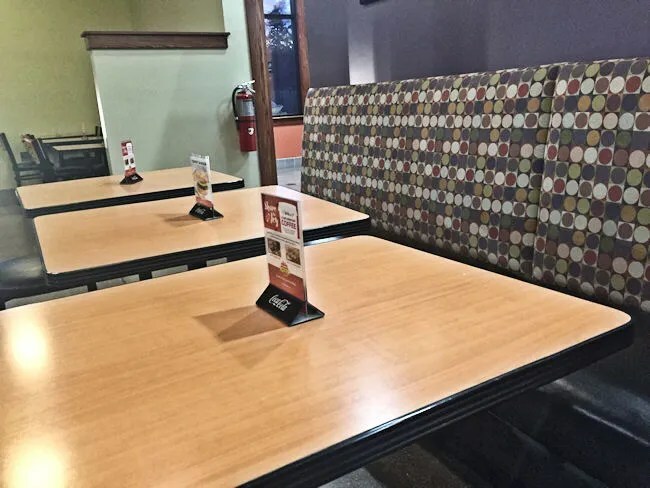 Another couple came in to the dining room and grabbed a couple of chairs then sat uncomfortably close to each other in front of the fire place with their hands on each other. It was 7:30 in the morning in a chain bagel shop and I ended up eating my sandwich as fast as I could because I felt like we were preventing them from doing whatever it was they wanted to do to each in this very public place. A couple minutes after we sat down, a guy came out of the kitchen with my sandwich. 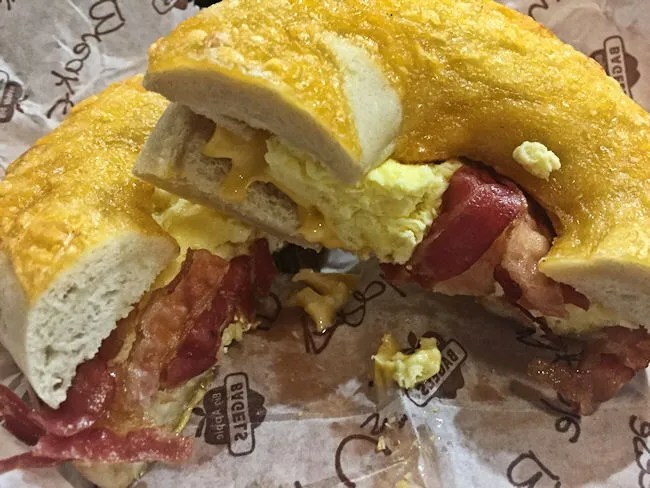 The toasted bagel was sliced in half and contained scrambled eggs, bacon, and American cheese. There was a big portion of the freshly made scrambled eggs that melted cheese going all the way through it. The bacon was a little on the rubbery side like it had been sitting there for a while, but it usually is on sandwiches like this. The sandwich was about as good as you would expect it to be. It’s a classic sandwich on a fresh bagel. Simple and delicious. I see charges on our credit card from Big Apple Bagels all the time. I know J was happy to see them open in a new shop. She was pretty bummed when the old one closed. I’ve only eaten there a couple of times, but it’s always pretty solid food. Grab and go breakfast options typically lead to McDonalds. Finding other places with food that’s just as good is always a bonus.